Summary of President William McKinley for Kids: "Wobbly Willie"
Summary: William McKinley (1843-1901), nicknamed the "Wobbly Willie", was the 25th American President and served in office from 1897-1901. The Presidency of William McKinley spanned the period in United States history that encompasses the events of the Maturation Era or the Gilded Age. President William McKinley represented the Republican political party which influenced the domestic and foreign policies of his presidency and his Open Door Policy. The major accomplishments and the famous, main events that occurred during the time that William McKinley was president the Spanish-American War (1898), 1898 Treaty of Paris, the Annexation of Hawaii (1898), the Boxer Rebellion (1899-1901) and the Gold Standard Act (1900). The period also witnessed the Galveston Hurricane of 1900, the completion of Grant's Tomb and the invention of the Zeppelin Airship. William McKinley was assassinated at the Pan-American World's Fair by anarchist Leon Frank Czolgosz. The President's wounds became gangrenous and William McKinley died 8 days after he was shot on September 14, 1901, aged 58. The next president was Theodore Roosevelt. The summary and fact file of William McKinley provides bitesize facts about his life. The nickname of President William McKinley provides an insight into how the man was viewed by the American public during his presidency. The meaning of the William McKinley nickname "Wobbly Willie" refers to his opponents criticism that he was indecisive. The meaning of his nickname "Ohio Napoleon" was in reference to his firm backing (as fearsome as Napoleon) of the 1890 Tariff Act that increased almost 50% duty on imports to protect domestic industries. The character traits of President William McKinley can be described as outgoing, genial, witty, fair, determined, honest, cheerful and friendly. It has been speculated that the Myers-Briggs personality type for William McKinley is an ESFJ (Extraversion, Sensing, Feeling, Judgment). An outgoing, sociable, expressive character and a nurturer of established social institutions. 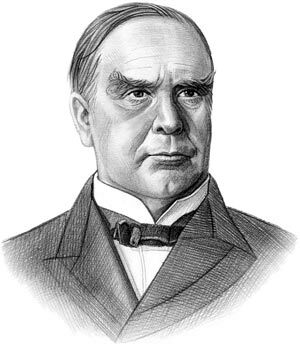 William McKinley Personality type: Friendly, gregarious, cooperative, observant and informative. The accomplishments of William McKinley and the most famous events during his presidency are provided in an interesting, short summary format detailed below. Summary of the Dingley Tariff: The Dingley Tariff was passed on July 24, 1897 and increased duties by an average of 52% and on some items 57%. The Dingley Tariff was the highest protective tariff in the history of the United States. Summary of the 1898 Treaty of Paris: The 1898 Treaty of Paris followed the Spanish-American War in which the United States annexed Puerto Rico, Guam and the Philippines. Spain renounced all rights to Cuba and ceded Puerto Rico and Guam to the United States and sold the Philippine Islands for $20,000,000. Summary of the 1898 Erdman Railway Labor Act: The 1898 Erdman Railway Labor Act set up arbitration procedures to settle railway disputes and alleviate labor unrest in the railroad industry. Summary of Grant's Tomb: Grant's Tomb, aka General Grant National Memorial, was dedicated as the final resting place of President Ulysses S. Grant on April 27, 1897, on the 75th-anniversary ceremony of the general's birthday. Summary of the City of Greater New York: The expanded City of Greater New York was created on January 1, 1898 by the consolidation of the existing City of New Yorkwith Staten Island, East Bronx, Brooklyn and most of Queens County. Summary of Annexation of Hawaii and Queen Liliuokalani: Queen Liliuokalani was the last Queen of Hawaii until the Annexation of Hawaii in 1898. Summary of the Boxer Rebellion: The Boxer Rebellion erupted in China (1899 - 7 September 1901). The Battle of Peking resulted in joint forces of eight foreign nations based in the capital ended the Boxer’s siege of Peking on August 14, 1900. Summary of the Gold Standard Act of 1900: The Gold Standard Act of 1900 was signed into law by William McKinley on 14 March 1900. establishing gold as the only standard for redeeming paper money. Summary of the Galveston Hurricane: The Galveston Hurricane in Texas hit the town on September 8, 1900 and resulted in the destruction of over 3,600 homes were destroyed. It is estimated that 20% (1 in 5) of the population, nearly 8000 people, were killed in the deadly Galveston Hurricane. Summary of the Zeppelin Airship: The Zeppelin Airship was patented in the United States in 1899. Summary of the President McKinley Assassination: The President McKinley Assassination was perpetrated by Leon Frank Czolgosz, an anarchist from Cleveland, Ohio on September 6, 1901 inside the Temple of Music exhibition at the Pan-American World's Fair in Buffalo, New York. The wounds of President McKinley became gangrenous and he died, eight days after he was shot, on September 14, 1901. The article on the accomplishments of William McKinley provides an overview and summary of some of the most important events during his presidency. The following William McKinley video will give you additional important history, facts and dates about the foreign and domestic political events of the administration of William McKinley.